Fura Gems Inc., a gemstone mining and marketing company with emerald and ruby assets in Colombia and Mozambique, respectively, has announced that it has entered into a merger of ruby assets agreement, pursuant to which the Company will acquire controlling ownership in the issued and outstanding shares of entities and interests in joint ventures that collectively own interests in nine additional ruby licenses (collectively, the “Assets”) in the Montepuez District of Cabo Delgado province in Mozambique (the “Acquisition”). 20 months after completion of the Acquisition, Fura will issue A$4million in shares at C$1.80 per share. Fura is exploring the benefits of pursuing a dual listing of its common shares on the London Stock Exchange. Dev Shetty, Fura’s President and CEO, commented, “I am pleased to announce the merger of these ruby assets with those of our existing licenses in Mozambique transforming Fura into the largest ruby group by licence area in the country. 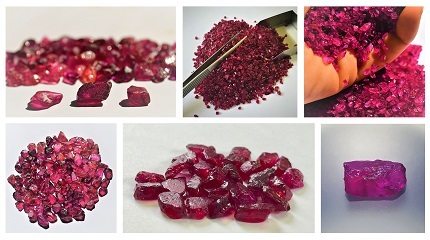 Our team has in-depth experience in the Mozambique ruby sector having previously worked in Mozambique since 2011 where they were instrumental in discovering and developing what is largely considered the world’s largest ruby deposit. Based on our extensive work in-country, we believe these combined licenses to be some of the highest quality ruby licenses available in Mozambique. Fura and a wholly owned subsidiary of the Company have entered into a merger of ruby assets agreement (the “Merger of Assets Agreement”) dated July16, 2018 with Mustang, a publicly traded company on the Australian stock exchange, Montepuez Minerals Pty Ltd., a subsidiary of Mustang, and Regius. Pursuant to this agreement, Fura will acquire the controlling ownership in various entities owned by both Mustang and Regius, that together own nine mineral exploration licenses (license numbers 9307C, 7083L, 6106, 8188L, 6064L, 7251L, 5030L, 8955C and 8921C) in Mozambique. A table with further details of the licences is provided below. The aggregate purchase price pursuant to the Merger of Assets Agreement is A$15,000,000 and shall be payable as outlined below. Fura Shares with a value equal to A$4million, with such Fura Shares to be issued at $1.80 per share, to be issued on the day that is twenty months following Closing. Upon closing of the Acquisition, Fura will hold effective interests in the Assets of between 65% and 80% with the remaining interests, non-dilutive and free carried, being held by the respective local partners. The Assets cover approximately 711sq. km (71,100 hectares). Fura intends to invest up to C$25 million (subject to operational success) over a period of three years, in a programme of drilling, bulk sampling and production mining on the properties comprising the Assets. Other initiatives that Fura intends to launch include: the reconfiguration of the existing wash plant to increase efficiencies; extension and/or consolidation, where appropriate, of certain of the ruby licences; and the implementation of grading and marketing systems via Fura’s existing marketing platform. All of the Fura Shares issued by the Company pursuant to the Acquisition will be subject to lock-up agreements pursuant to which the vendors shall be restricted from selling or transferring such securities during the twelve months following the date of the issuance of the Fura Shares to the vendors. The Acquisition is an arm’s length transaction for the purposes of the policies of the TSX Venture Exchange (“TSXV”) and is subject to the approval of the TSXV. Fura is not paying any finder’s fees in connection with the Acquisition. The closing of the Acquisition is subject to the satisfaction of customary conditions precedent, including, inter alia, receipt of ministry and joint venture authorizations, approval of the TSXV and the provision of applicable legal opinions concerning the title to the Assets. Hannam &Partners Advisory Limited acted as sole financial adviser to Fura in relation to the Mustang and Regis acquisition.